Meet Noelle! She’s about a year old and recently weaned 4 sweet little babies. She is now enjoying her freedom to be a cat where she can play and rest while she awaits her forever home. She also loves to snuggle. She gets along well with dogs and kids and other cats. 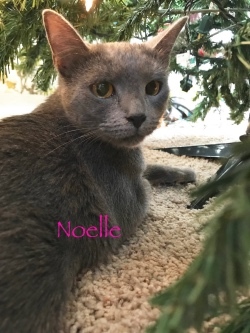 Noelle has been tested, fixed and vaccinated and is super sweet and friendly. If you are interested in meeting or adopting Noelle, please contact Trinity at 419-277-9499.